Possibilities and challenges for crowdsourcing in European, national and local levels. Workshop hosts share their experiences in crowdsourcing. Learning from these cases is contributed to drafting European level crowdsourcing pilot. Presenting workshop discussion and drawing conclusions. Please feel free to stay for refreshments, snacks and especially for getting to know awesome new people! 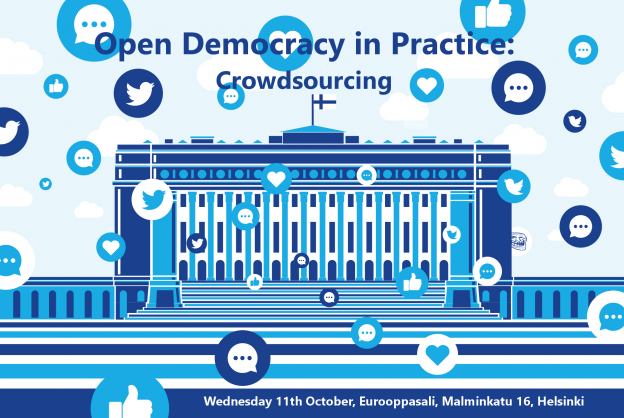 The EUCROWD event in Helsinki is organized by Open Ministry and the Institute of Deliberative Democracy with the financial support of the Europe for Citizens programme of the European Union.